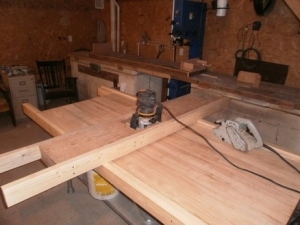 Homemade router planing jig fashioned by adding 2x4s to the sides of a planer sled. Intended as an aid in leveling a cupped maple butcher's block table. Nolan, wouldn't the power planer smooth the surface well but since it doesn't know how deep to go, like the router does, it could over-plane an area? Just wondering? looks good. but why not just use a hand held power planer?